Building on its any Cloud, any application and on any device vision, VMware has launched new solutions and upgrades for identity management, unified endpoint management, and management and security. 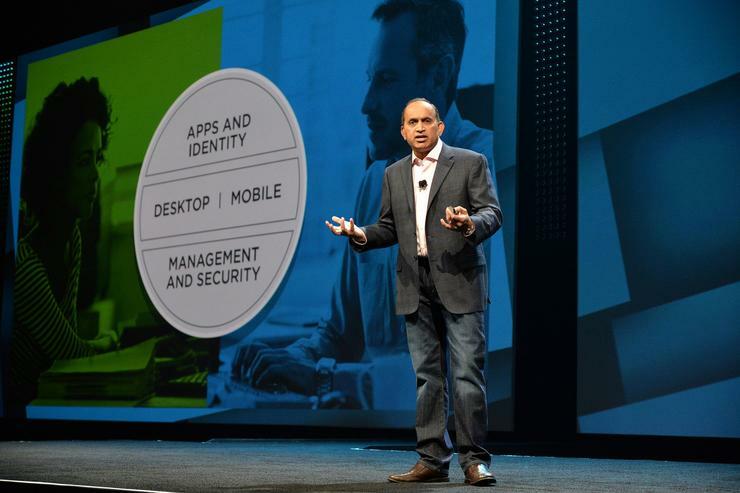 At VMworld 2016, VMware end-user computing desktop products senior vice-president and general manager, Sumit Dhawan, spoke about Workspace One, a singular platform that enables partners to provide a digital transformation and workspace transformation to customers. “If you see the world today, there are different applications that sit on the Cloud. The policies as to how the workspaces have to be configured, who has access to which applications, and when the application has to happen, that can no longer sit in any directory. It needs to be tied to users. “Hence, identity can no longer be a side add-on but the core. And you have to put it together with mobile. That is the foundation of Workspace One,” he said. VMware end user computing general manager and head of global marketing, Sanjay Poonen, said it builds on the capabilities of desktop and mobile coming together. Poonen said the most interesting aspect of this is the security industry adopting it. “Companies like Palo Alto Networks and CheckPoint are embracing our vision in this,” he added. VMware chief technology officer and executive vice-president, Ray O’Farrell, highlighted the opportunities of AirWatch and said VMware’s partnerships play a critical role in its success. O’Farrell mentioned channel partners currently face a balancing act of enabling a digital transformation with agility and speed but also securing the enterprise. “When we talk about Cloud native applications, you need to embrace a whole new range of technologies like containers and scheduling technologies and meet scalability, security, and reliability,” he said. VMware Cloud platform business chief technology officer, Kit Colbert, said this was the reason behind the update of its enterprise container infrastructure – vSphere Integrated Containers and Photon that were launched last year. vSphere Integrated Containers has been updated with a new container registry and container management portal. Its Photon platform will drive simplicity into the infrastructure aspects of the infrastructures. A new commercial version of Photon will also be made available on the VMware Pivotal Cloud native stack. “If we look at where we are today and that Cloud native future that we want to get to, these VMware solutions will help you on that journey,” he added. VMware networking and security executive vice-president and general manager, Rajiv Ramaswami, spoke about network virtualisation, claiming the market is going through one of the biggest transformations he has seen. He added that with more hyper converged coming on board and underlying commodotisation from a hardware perspective, it has led to networks becoming simpler. This addresses the need for VMware NSX. VMware storage and availability general manager and senior vice-president, Yanbing Li, spoke about Virtual SAN, saying that Cross-Cloud architecture needs a strong storage foundation, powered by the solution. Li added that the company will continue to push the boundaries in three categories: workloads (containers and Big Data), analytics and policies, and security. Read more VMworld 2016: VMware remains "stable" amidst "turbulent waters"
“The future is all about data. VMware will extend the focus from storage to data. The opportunity is going to be even bigger. But we can’t do it alone. This is where we work closely with many of the ecosystem partners to help us along this journey. “VMware wants to break IT silos, starting with virtualisation and the software defined datacentre. We want to help businesses build a hybrid Cloud that is unmatched, automated and future proofed for the next generation,” she added. Hafizah Osman attended VMworld 2016 as a guest of VMware.